This is a multi-media conversion/upgrade kit (white metal and resin) produced by MR Models of Germany. It is designed to be used with the Italeri/ESCI M4A1 kit. 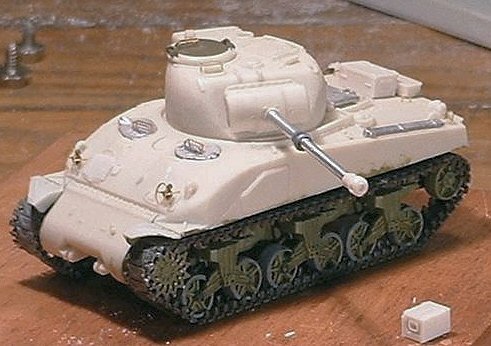 It comes with a replacement upper hull, a replacement turret, new bogey wheels, a turned aluminium barrel and various other fittings in resin and metal. 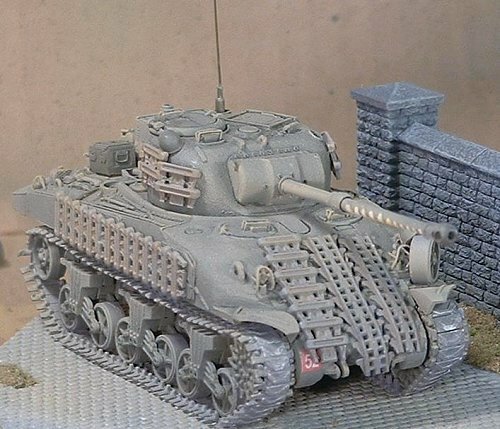 Unlike most 1/72nd scale resin Sherman kits, it is an entirely new moulding for the upper hull and turret. The moulding itself is excellent, holding such detail as subtle welding beading along the rear sides of the hull and realistic texture to the cast glacis and turret. MR Models has obviously worked carefully to remove all of the problem areas of the original ESCI moulding from the mid-70s. For example, they have recast all of the bogey wheels to include more accurately detailed hubs. MR Models has also addressed the overly tall stance of the ESCI kit. The instructions call for the builder to use the lower hull sides and bottom of the styrene kit, but require that the top 5 mm be carved off the top of the sides to bring the sponsons closer to the top of the tracks. The builder also has to cut off the lower hull sides forward of the front bogie assembly. This is to allow the one-piece resin transmission cover and drive wheel mountings to be fitted (very nicely cast). It is also necessary to carve off the mountings for the idler wheels at the rear and replace them with a two-piece, detailed replacement unit. The MR Models resin turret is really nice, with good casting texture and sharp details. Unfortunately, while the MR Models hull is hollow, the turret is moulded as a "plug" (i.e. 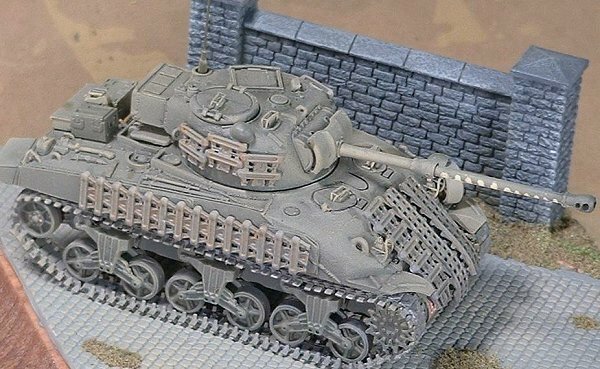 not hollow) - as a result, there is really no option but to build it with the turret hatch closed (the commander's hatch on the Sherman is really wide so even a sticking a figure in won't hide the lack of an interior). The loader's hatch, while nicely detailed, is moulded shut. The MR Models kit calls for the use of the original ESCI commander's hatch which I thought were little soft on detail but useable (the conversion provides white metal hatches for the driver and radio operator positions). I especially liked the moulding of the rear mounted overcoat storage box (the odd shaped container on the starboard rear of the tank), which was a special feature of the Sherman IC used to avoid blocking the access port for the hand-start crank. 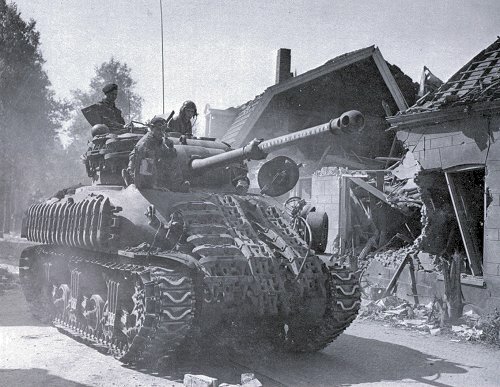 Since I decided to model the kit as a specific vehicle - a Firefly from the 5th Canadian Armoured Regiment/8th Princess Louise (New Brunswick) Hussars shown in a National Archives of Canada photo - there were a number of changes that I had to incorporate into my build. The first is a bit odd - in the photo it is clear the starboard set of tracks has extenders attached. The port side however does not seem to have the extenders. I considered whether perhaps the port side had simply lost a long run of the extenders due to road damage but there doesn't seem to be any sign of even pieces of extenders. There must be some explanation of why the tank has this configuration, but I don't have it. To represent the track with extenders on the starboard side, I used an aftermarket white metal set produced by Fine Scale Factory in Germany. These include the extenders, although I find the detail a bit soft. 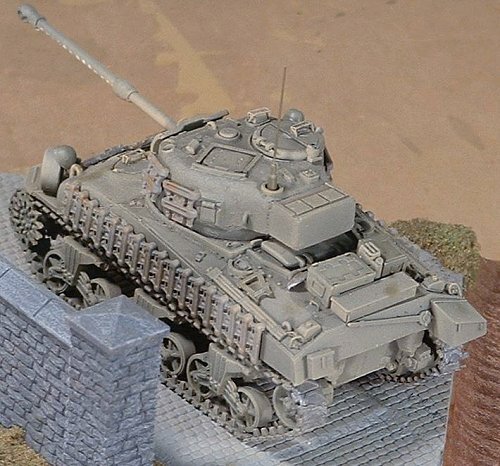 For the port side I used the hard styrene track, which comes with the ESCI/Italeri M4A1 kit. I also added a false muzzle brake half way along the gun barrel, as shown in the National Archives photo. This was made from an old airplane propeller hub. Once I had assembled the main components, I added etched brass details (such as lift rings, headlight and periscope guards etc.) 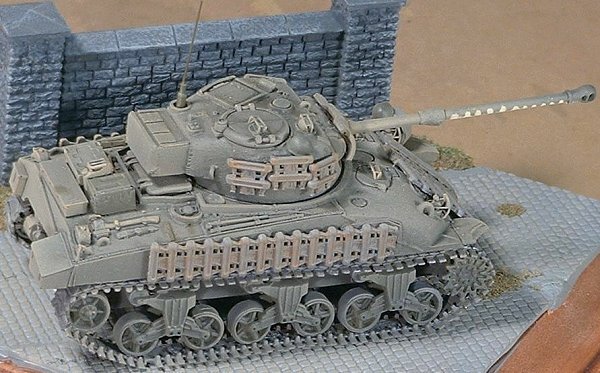 from the Extratech set produced for the Revell M4A1. I then painted the vehicle with Testors Modelmaster Acrylic Green Drab (I had already painted the track assembly - Green Drab for the metal parts and medium grey for the tracks themselves). Following this, I used a wash of Olive Green darkened with flat black around those areas, which would not get a lot of wear. 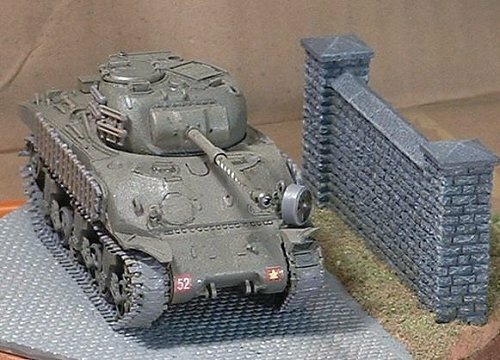 The vehicle I had chosen to model also had extra armour added in the form of Churchill tracks welded to the hull and turret. For the most part, I used the ESCI Churchill hard styrene tracks to represent this feature on both hull and turret. Unfortunately, on the front glacis it is clear from the photo that one of the lengths of track was welded on upside down (i.e. cleat side up). The ESCI tracks have no detail on the inner side, so I couldn't use them. 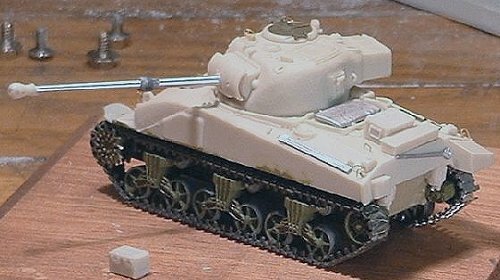 Instead, I used a set of soft plastic Churchill tracks (possibly from the Matchbox or Airfix kit), which had a general approximation of the inner side. The additional track was painted a medium grey colour, then dry brushed with a rust/medium brown colour, as was the Sherman track. In the photo the crew has obviously painted the long 17-pounder barrel with a disruptive pattern. I hand painted this on the aluminium barrel provided by MR Models. I then air brushed the model with a light tan colour. This highlighted high wear areas and brought out the fine texture of the cast areas of the tank. Next, I added extra gear, including the spare bogey wheel on the port front fender, an antenna, the two tanker helmets that can be seen in the photo, and a selection of boxes and stuff on the rear deck. The 17-pounder shell boxes are produced by MR Models in a separate kit and the jerry can is from MarS of Poland. The shovel, which replaces the overly large ESCI version that comes with the M4A1 kit, is from the ESCI 25 pounder kit. I decided to portray it tossed on the rear deck rather than strapped into place on the side of the tank. After the extra gear was in place, I gloss coated the model and added the arm-of-service and divisional markings to the front glacis. These are from Aleran Decals. The AoS marking is visible in the photo beneath the Churchill track. The Divisional marking (5th Canadian Armoured) is not visible in the photo but I figured it was probably there just beneath the extra track. These are the only markings visible - there may be markings on the rear of the tank but my research indicated that these were not necessarily as common as front markings. The serial numbers on the sides would be covered by the additional Churchill tracks. I then dull-coated the model and applied a final light dusting of flat tan. The tracks also received a bit of work with a soft pencil to simulate the bare metal of the chevrons. This was one of the kits I took down to AMPS this year. For those of you who aren't familiar with AMPS (Armor Modeling and Preservation Society), the organization has developed and uses a very detailed judging system. Unlike most competitions, pieces are judged not against each other (i.e. 1st, 2nd, 3rd) but against a fixed set of criteria (and are awarded a gold, silver or bronze). They judge only your work, not how it stacks up against other models on the table. These criteria are available on the AMPS site. A really great feature of this judging approach is that not only do the judges (usually a team of four or five) take a good amount of time examining your work, but they also provide written comments sheets indicating the score you received in the three major criteria categories (9 sub categories) and why. These are necessarily brief (i.e. seam lines on engine deck, decals silvered on turret, etc.) but usually of great use to the modeller who wants to improve and do better on the next model. Heres how I did. Okay, so no one liked the tracks much  that didnt surprise me. I found the Fine Scale Factory white metal tracks not very easy to work with, particularly around the rear return roller. Im not certain if the first judge was referring to this when he docked me for "running gear alignment problems"  as far as I can tell I did get all my bogies lined up, although there is a slight tilt to the port side. With regard to the second judges comment, I had purposely had one of the boxes on the rear deck less weathered than the others. My thought had been that to have them all uniformly dusty and worn wouldnt look right  some of the boxes should look like they had been opened more recently. On reflection, however, I think the judge is right, there should be an even layer of dust over the stuff on the back after even a brief road trip. I came away from AMPS very pleased with the performance of this kit. Oddly enough, however, despite the score sheet indicating a 24 out of 30, which would be a silver medal, I received a bronze medal. I think this might be due to some confusion about the awarding of the extra 0.5 points for my written description. I understand that in some cases the judges awarded the half point in cases where the work did not meet the requirements of the AMPS rules. This is likely the case in my judging. Either way Im not broken up about it - a score of 23.5 at AMPS in the advanced category is great. A different coloured "gong" wouldnt have made me any happier.